I'm looking to buy some reusable produce bags. I think I'm in the habit now to use my reusable shopping bags, and now I can move on to something else. I spent some time looking on Amazon for some the reusable produce bags, and there are plenty of options. There was one particular set with high ratings/reviews, but then I started to read more into the questions section about the product. Quite a few of the options I was looking at said the bags were made out of the country. I'm not surprised, a lot of things are. I started to think about this more, and I'm trying to buy more things here in America. I realize this is a global economy and the world gets smaller every day, but this is something I want to do. I think I'm going to buy some bags through Etsy. I don't know a whole lot about Etsy, and haven't purchased anything from it before, but it looks like a good site. 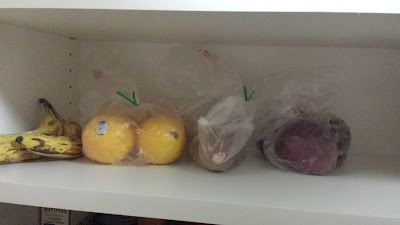 (https://www.etsy.com/about/) There are handmade reuable produce bags for sale, and after I talk to a friend about their Etsy experience, I will probably order them tomorrow. These bags are going to cost me more compared to buying them through Amazon, but I'm willing to pay the price. This extra cost pays someone to take the time to make the bags by hand. I can also ask the seller questions before ordering the bags. I might be making a bigger deal out of this than what is needed, but I also need to be more cautious about what I'm purchasing. Doing research and due diligence will prevent me from ending up with reusable bags that do not work for me.